Yonkers, NY Yonkers Industrial Development Agency (IDA) has approved financial incentives for Extell’s $502 million mixed-use complex to be built on a site along the Hudson River. 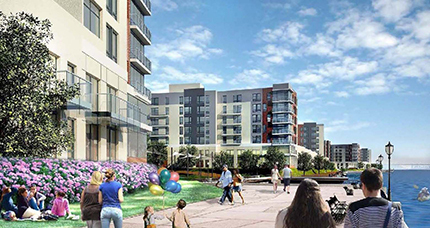 It is the largest residential project to receive financial incentives from the Yonkers IDA. The project, which is located on a site adjacent to the MTA bus depot, involves construction of 1,395 residential units in seven building with 48,280 s/f of commercial space and 1,587 parking spaces. Financial incentives, which were approved at the Yonkers IDA’s meeting on August 29, include $15.382 million in sales and use tax exemption and $5.875 million in mortgage recording tax exemptions. Extell is also seeking a 20-year payment in lieu of taxes agreement (PILOT) consisting of an annual payment of $4.519 million. The project is expected to create 200 permanent jobs and 450-500 construction jobs. It is to be developed in phases over a 10-year period. The complex will help revitalize a section of the city’s waterfront that has been underutilized for years while creating a new residential community that will support current and future merchants and restaurants. It will also provide a variety of housing options for city residents by incorporating both market rate and affordable units. Established in 1982, the Yonkers Industrial Development Agency is a public benefit corporation that provides business development incentives to enhance economic development and job growth in the City of Yonkers.